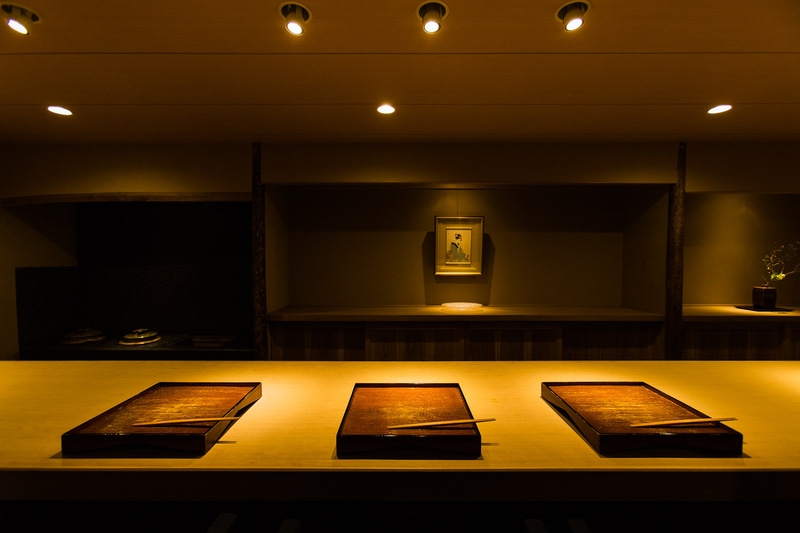 Orchestrated by a true master of Japanese culture, the kaiseki at Tominokoji Yamagishi goes far beyond a culinary experience. 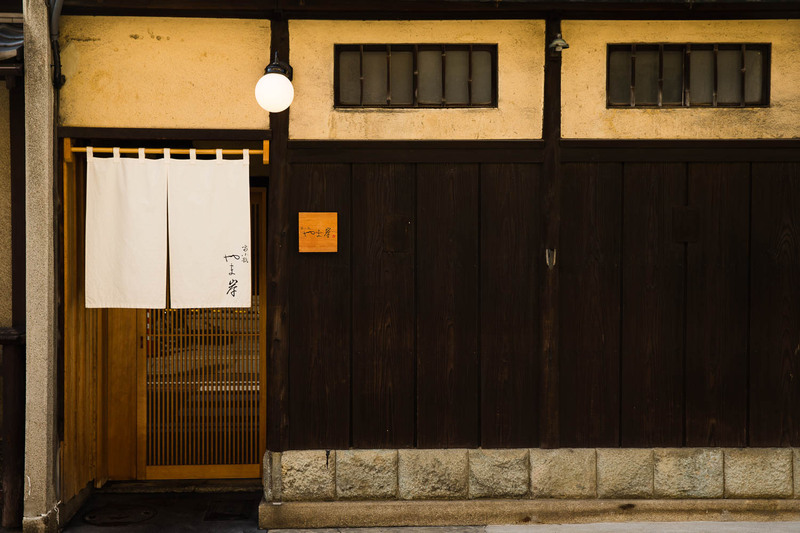 Surrounded by perfected traditions of tea ceremony, flower arrangement and calligraphy, this superb Kyoto restaurant will promise you a renewed and profound appreciation for Japan. Tominokoji Yamagishi opened its doors in 2015 to those who dream of discovering the hidden wonders of this ancient city. When you walk under the white curtain draped over the entrance, a narrow path made of dark paving stones and foot lanterns guide you into a breathtaking 130-year old building. Inside, a grand 22-feet counter stretches across the room, softly lit with spotlights. It’s not only its sheer size that astonishes you but the beautiful surface of the hinoki wood that is as smooth as silk. Only nine guests will have the pleasure to sit around it and enjoy the beautiful details such as the seasonal flower arrangement set behind the open kitchen. Chef Takahiro Yamagishi, the man behind every flavor, detail and concept of the restaurant, greets you with a warm smile. A teacher of multiple Japanese traditions and a former sushi chef, he has perfected the art of kaiseki by studying its cultural roots. Not only so, he has also brought together old traditions with new ideas to introduce elements of surprise in the cuisine. “We want our guests to indulge in various aspects of Japanese culture while eating our food,” he says as guests are repeatedly impressed by the depth of his knowledge. The principle behind Tominokoji Yamagishi’s cuisine is cha-kaiseki, a special meal that is served in traditional tea ceremony. The flow of the meal is made up of a dozen courses, each with its own purpose and character. 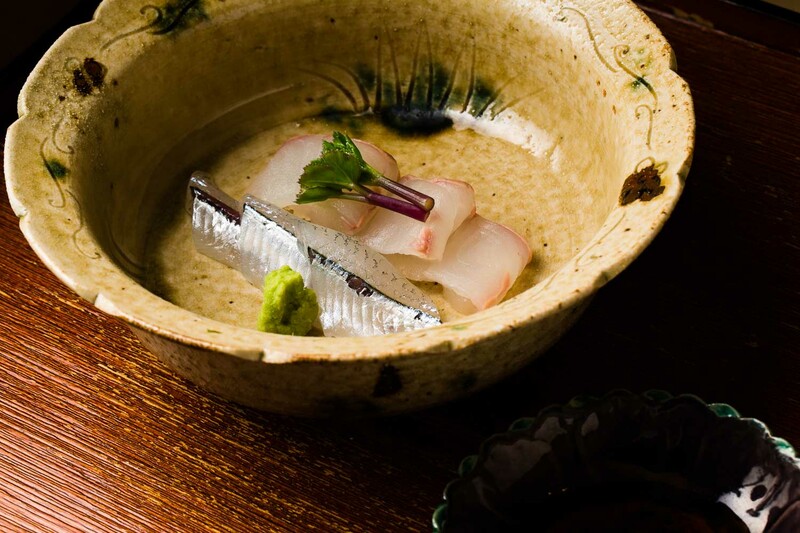 The opening dish, crucial in setting expectations for rest of the meal, is fresh sashimi of flounder and halfbeak, served in a beautiful green ceramic bowl. 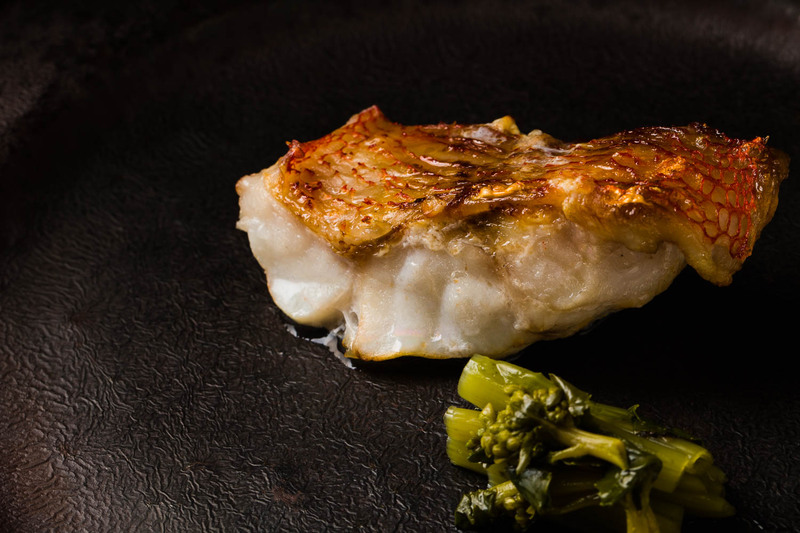 The flounder, folded in neat layers, is soft on the tongue and bursting with umami. The strips of halfbeak is so fresh it has a beautiful silver shine and a smooth texture. 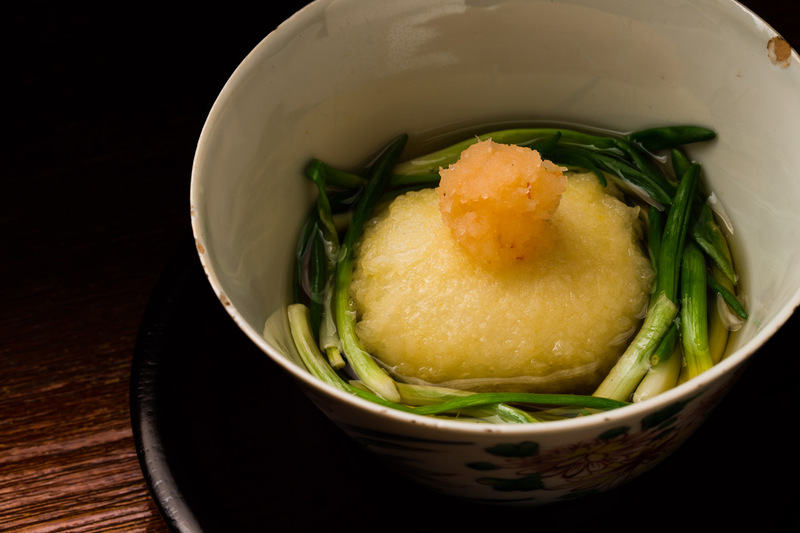 In kaiseki, the soup is said to be a reflection of the restaurant’s quality. Tominokoji Yamagishi’s approach is simple yet powerful. 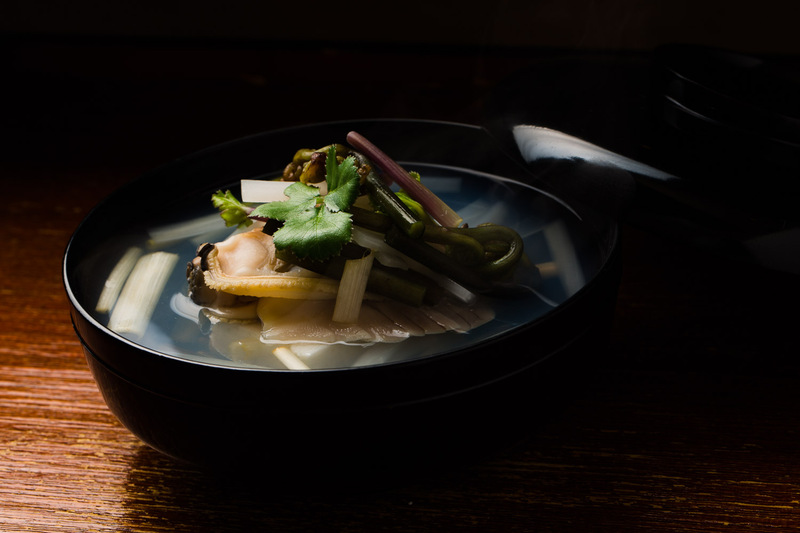 The soup is a clear broth made of simply the highest quality kombu, bonito, and fresh water from their well, and topped with a big plump clam and steamed white fish. The aroma alone reminds you of the deep blue sea. The next dish has become one of the reasons why foodies have come back again and again to this restaurant. 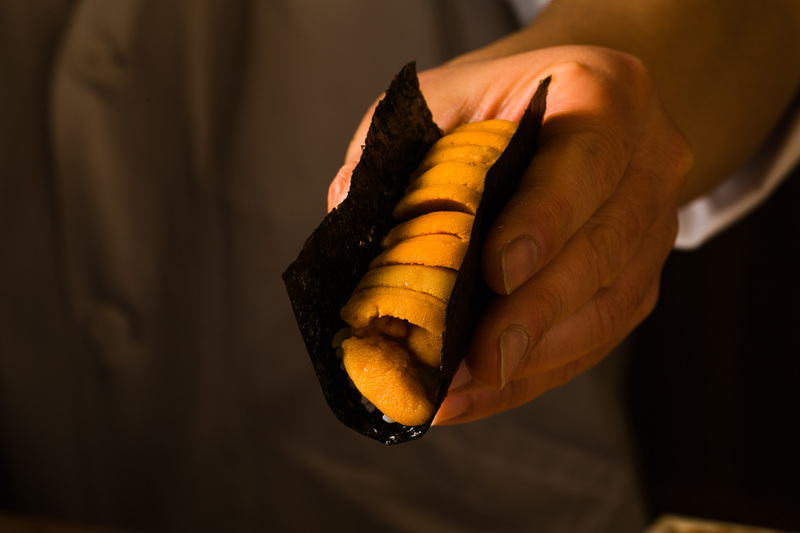 Utilizing his years of learning as a sushi chef, Yamagishi’s surprise dish is a huge hand roll of sea urchin. This is no ordinary roll. There is at least a dozen pieces of sea urchin layered on top of shiny vinegared rice and wrapped with a large piece of crisp seaweed. Not to waste seconds, the chef passes it directly from his hand to the guest’s as it’s made. The “Sugi Hassun” is the ultimate signature dish that symbolizes the essence of the restaurant. It marries the day’s single best ingredient from the seas and another from the mountains. 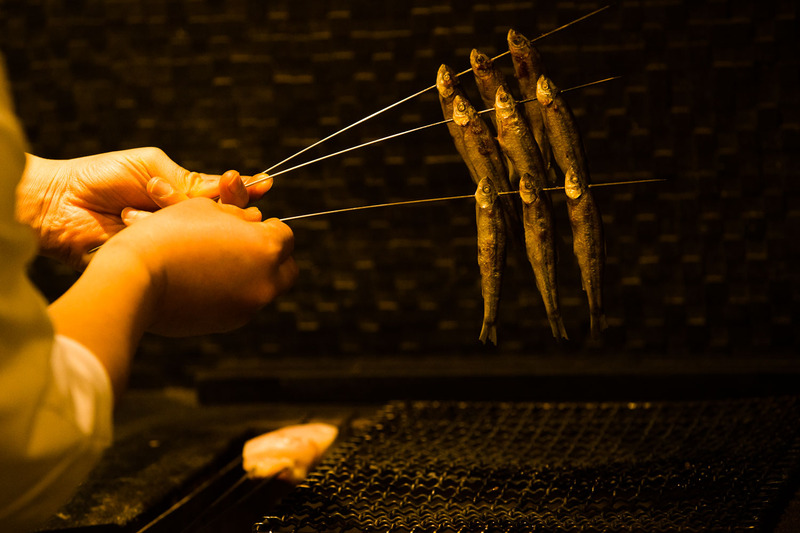 The catch of the day is moroko, a species of ray-finned fish native to Lake Biwa, perfectly grilled over crackling charcoal. From the fields are bright green fava beans steamed in syrup, draped with egg yolk vinegar. 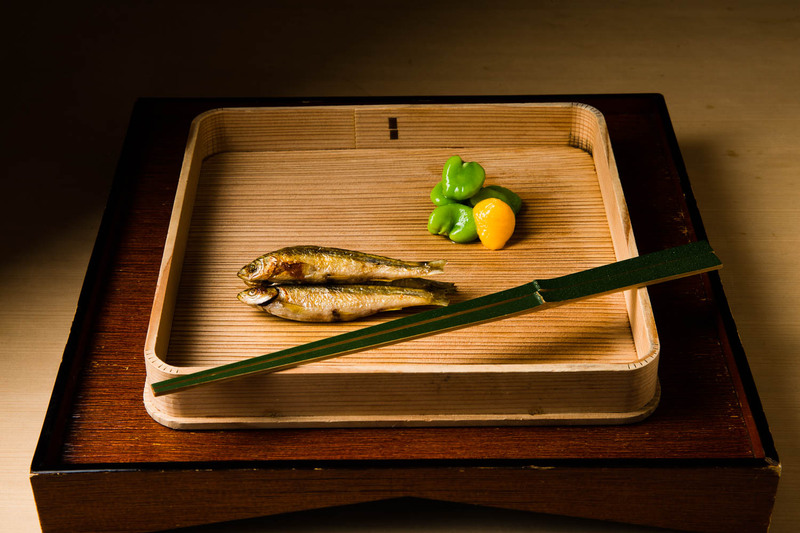 Served in a beautiful square bamboo tray, the contrast in flavor, color and texture is impeccable. Among other memorable dishes on the menu is a bowl of blowfish, where the soft flesh is fried in light crisp batter and dipped in flavorful broth soup. 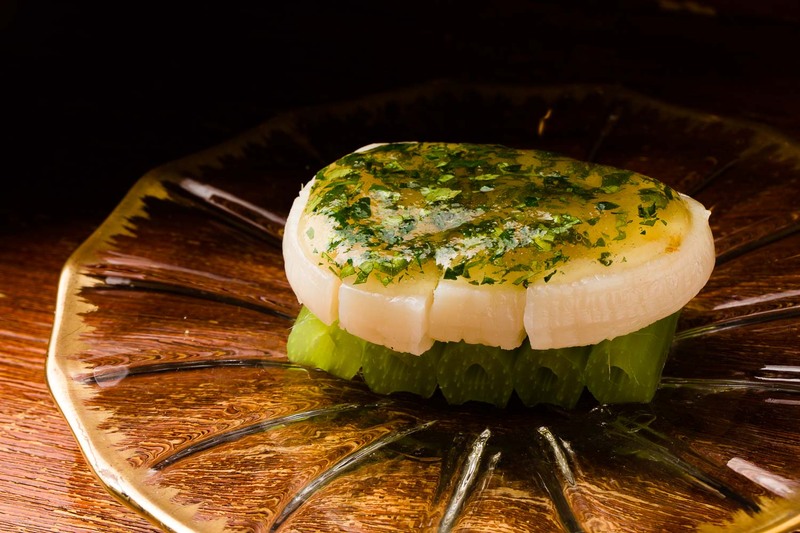 Another is a picturesque dish of grilled hiragai shell fish, beautifully layered on top of with Japanese butterbur and topped with aromatic kinome herb leaves. Yamagishi sources most of this ingredients from the local Nishiki market in downtown Kyoto. His other channels include a relative who runs a farm in Shiga Prefecture and a fisherman specializing in moroko and smelt in Lake Biwa. To guarantee freshness and quality, he likes to procure from suppliers he’s established relationships with. He also takes his time in selecting the best of local produce, especially vegetables that are unique to Kyoto. Kinuhikari from Shiga Prefecture is his favorite rice, which is lighter and less sticky. He carefully cooks the grains in a masterpiece earthenware pot made by Ippentoh Nakagawa of Shibaraki Kumoigama. The restaurant of course has a collection of sake and wine to choose from, each carefully selected to complement the flavors of the food. Born and raised in Kyoto by a fisherman father, young Yamagishi dreamed of becoming a chef and cooking his fresh catches. He began his culinary career as a sushi chef at Nanaezushi in Kyoto, while spending a lot of time at the central fish market to learn about fish varieties and supply chains. Later, he began working at a hotel where he discovered the world of kaiseki. He followed a prestigious path of training at the city’s top restaurants like Tankuma and Kyoto Ichi No Den, building a star resume that anyone in the profession would dream of having. Yamagishi has an incredible attitude towards learning. Not only is he a culinary master, he also has multiple high-level licenses in tea ceremony, Saga Goryu flower arrangement, calligraphy, and Kyoto Expert Certification. In addition to his role as head chef, he also offers flower arrangement classes twice a week on the 2nd floor of the restaurant. “My appreciation for flower comes from my grandmother who taught me the beauty of having flowers in the home,” he recalls. All the flower arrangements in the restaurant is of course his own work. He also has an incredible appetite and loves to eat out. During his occasional trips to Tokyo, he would often eat at 3 different sushi restaurants back to back and end his evening with mid-night feast at a Korean BBQ. He can’t drink so he’s happy to fill up his stomach with great food. This habit of his has created a great network of friends at various restaurants. He also sees the importance of passing on traditions to the next generation. For that reason he is mulling opening a sister restaurant to add more younger apprentices. And to appeal to younger and newer customers, he welcomes and embraces new technologies such as social media. “It’s great how more people know about us because of Instagram these days,” he says. 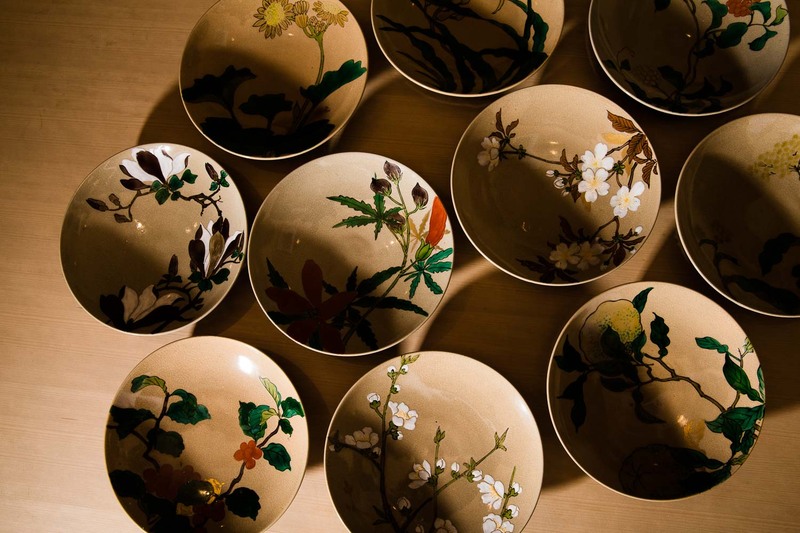 Yamagishi’s tableware collection is museum-class. Over the years, he has collected a wonderful variety of precious ceramics, ranging from simple to gorgeous designs. 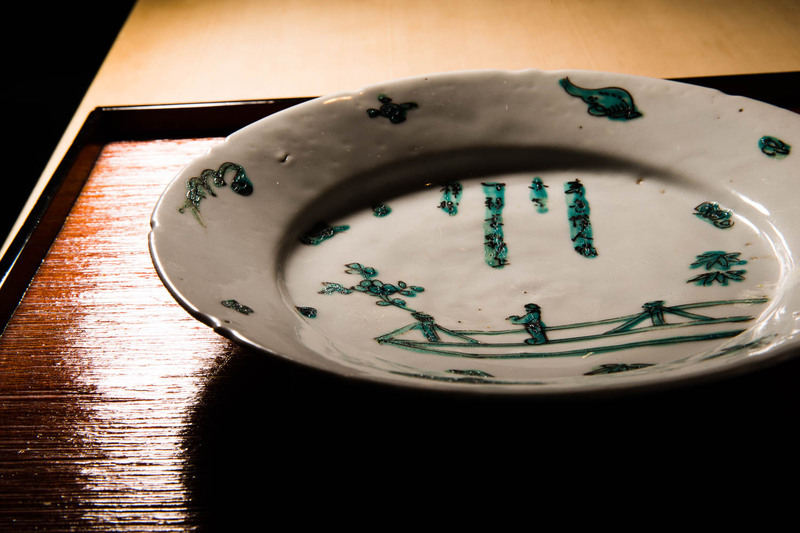 A green flat dish from 17th-Century Ming Dynasty that he bought from a museum 25 years ago is among his favorites. Another is a set of Eiraku dishes, each painted with delicate flowers from all seasons, reflecting the chef’s deep appreciation for flowers.